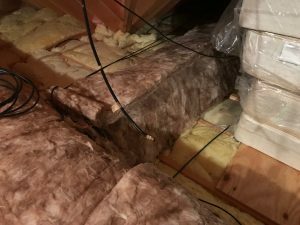 Will Flex Ductwork tubing in Attic Have Condensation Issues? Hi Mark, I have a modular house with a central air return thru the attic. It is a flexible tube with a thin layer of insulation on it. Will I get condensation on it? Is there a way I could insulate it better? Also, is there a time life limit on that? Thanks, DM. Thanks DM for your question. No, you should not have any condensation issues. The bigger issue is the loss of heat from the thin layer insulation. I actually did a short video talking about that concern. See my article/video titled “Insulating Attic Heating and Air Conditioning Ductwork“. It believe it shows the concern you mention. What I ended up doing was wrapping the plenum and flex tubing with batt insulation. See pictures below. In regards to your condensation concern. The attic should have proper soffit and ridge vents/gable end vents in it so that the air in the attic is cold and dry during the winter. During the summer months, where you are concerned about warm moist air coming in contact with a cool surface, e.g. the flex tubing, and causing condensation on the tubing, you won’t see any. At least I never have seen any. I believe this due to the fact that the insulation that comes with the flex tubing is sufficient enough to prevent this from happening. The surface temperature of the flex tubing is typically quite warm, even when the cold air is running through it during the summer months. Thus, no condensation. 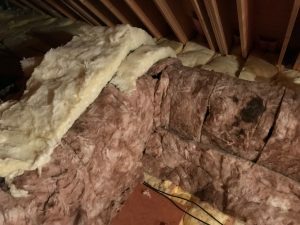 This said, another reason for adding more insulation around the plenum and flex ductwork is to prevent the heat from the attic from warming up the cold air running thru the duct work as it makes its way down the length of it and into the finished living spaces. This way your AC won’t have to work as hard or long during the hot summer months. For information on how to maximize a wood stove’s heating efficiency, see HomeAdditionPlus.com’s Installation of Hood over Wood Stove eBook. Free Heating and Cooling Price Quotes with No Obligation!